At the launch of the portable aflatoxin test kit. (L to R) Mr Mphatso Dakama, country officer, Partnership for aflatoxin control in Africa (PACA), Malawi; His Excellency Mr Anil Kumar, acting Indian High Commissioner, Malawi; Dr Allan Chilimba, Dr Anitha Seetha; Dr Moses Siambi, Regional Director, ESA; and Dr Betty Chinyamunyamu, Deputy CEO, NASFAM, Malawi. A new technology that detects aflatoxins on location, can save lives and open export markets for African and Asian countries. The rapid test kit device is also affordable at under US$ 2. This exciting advancement combined with a mobile extraction kit that will be ready in two months, will be the first portable cost-effective way for farmers and others to detect aflatoxins instantly. Currently, the test can be applied to detect aflatoxin in groundnuts. The test kit launched officially on July 26 by Dr Allan Chilimba, Deputy Director, Department of Agricultural Research Services (DARS), Lilongwe at ICRISAT-Malawi, requires limited technical knowledge or training and can be done on location by farmers, agro-dealers and food processors. For example it can be used by traders to check for contamination before concluding a sale. The rapid detection is useful for public health authorities to help identify suspected samples in cases of an outbreak of aflatoxin poisoning. The new test is simple to perform and can detect contamination at levels of 10 parts per billion (ppb) in less than 15 minutes. While the competitive Enzyme-Linked Immunosorbent Assay (cELISA) test, developed in 2000 by ICRISAT, which has to be done in a laboratory by trained technicians, and other analytical tests can take up to two days. Dr S Anitha explaining about the aflatoxin test. The compact portable device is based on the lateral flow immunoassay test (popularly known as the strip test like that used to detect glucose in human blood). If aflatoxin is present in the sample, then one pink line appears on the strip, whereas if the sample doesn’t have any aflatoxin, two pink lines will appear. “The device will contribute to manage and reduce the entry of aflatoxins in the food value chains, improve diagnosis for local and export trade and support the food processing industry to maintain low exposure levels in food products in our local markets as well as for export markets,” said Dr Anitha Seetha, Scientist, ICRISAT, Malawi. Aflatoxin is a toxic substance produced by mold fungi (Aspergillus flavus and A. parasiticus) that can grow on poorly managed agricultural crops, particularly groundnuts. It is synergistic with hepatitis viruses B and C.
“ICRISAT has been working with smallholder farmers in Africa to combat the aflatoxin problem. This kit will enable rapid and cost-effective deployment by the government and private sector to protect public health and also improve the export prospects for African countries,” said Dr David Bergvinson, Director General, ICRISAT. The development of the sample extraction kit is currently underway and will be ready in two months so that the whole process can be carried out in the field or anywhere else. 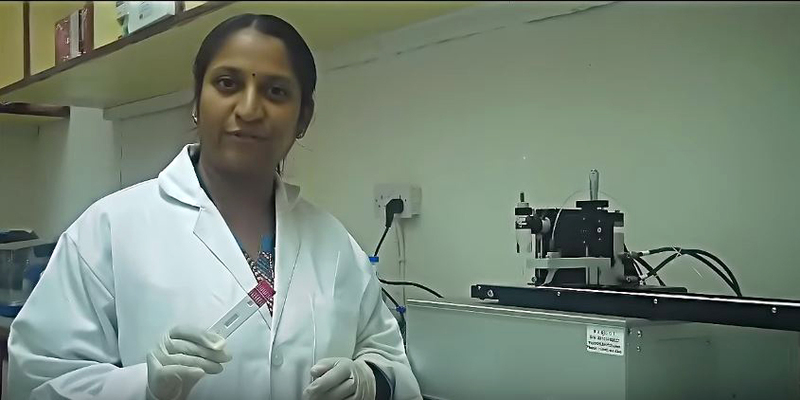 The kit has been developed by Dr Anitha Seetha. New varieties and management systems to improve productivity, food security and safety and market competitiveness (McKnight project).